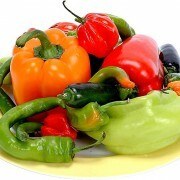 Peppers are warm season vegetables that require warmer temperatures than their popular neighbor, the tomato. Culturally, peppers grow well with okra and eggplant. Peppers come in a wide range of sizes, colors and flavors from sweet and mild to “Shoot me, I’m dying” spicy hot. Sweet peppers like Bell and Sweet Banana peppers are the most popular, but Jalapenos and other hot peppers still quite popular. Peppers originated in Central and South America, and are estimated to have first been cultivated between 5200 and 3400 B.C. When Columbus found peppers being grown by inhabitants of the Caribbean Islands and took them back to Europe, the new spicy vegetables were an instant hit. Pepper were immediately adopted by other cultures and were soon being grown all over the world.